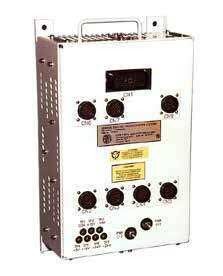 Espey developed this power supply for a major locomotive manufacturer. The high reliability power supply was designed and tested for extreme locomotive environmental conditions. This Power Converter operates from a very wide input ranging from 25 to 85 Vdc. There are six outputs (+5, +15, -15, +19, +24, -24 Vdc) with a total load power of 1000 W continuous and 1620 W for one-minute transients. All outputs are fully regulated with 115% current limiting and 125% OVP.